WASHINGTON (AP) — The number of Americans who signed contracts to buy homes dipped in June from a six-year high in May, a sign that sales could stabilize over the next few months. The National Association of Realtors said Monday that its seasonally adjusted index for pending home sales ticked down 0.4 percent to 110.9 in June. The May reading was revised lower by a percentage point to 111.3, but it was still the highest since December 2006. The slight decline suggests higher mortgage rates may be starting to slow sales. Still, signed contracts are 10.9 percent higher than they were a year ago. There is generally a one- to two-month lag between a signed contract and a completed sale. Economists were relieved after seeing only a modest decline. They said that shows higher mortgage rates are having only a small impact on the home sales market. “All told … pending home sales held up fantastically well,” Dan Greenhaus, chief global strategist at BTIG, an institutional brokerage, said in a note to clients. The average rate on a 30-year fixed mortgage has jumped a full percentage point since early May and reached a two-year high of 4.51 percent in late June. Rates surged after Chairman Ben Bernanke said the Federal Reserve could slow its bond-buying program later this year if the economy continues to improve. The Fed’s bond purchases have kept long-term interest rates low, encouraging more borrowing and spending. In recent weeks, Bernanke and other Fed members have stressed that any change in the bond-buying program will depend on the economy’s health, not a set calendar date. Since those comments, interest rates have declined. The average on the 30-year mortgage was 4.31 percent last week. Even with higher mortgage rates, signed contracts increased in the West last month. They were unchanged in the Northeast and fell in the South and Midwest. Home sales and prices have climbed since early last year, buoyed by solid hiring and historically low mortgage rates. Housing has been an important driver of economic growth this year as other parts of the economy have languished, such as manufacturing and business investment. Sales of previously occupied homes slipped last month, after a big rise in May to the highest level in 3 ½ years. But new-home sales jumped in June to the fastest pace in five years, boosting confidence that the housing recovery is strengthening. Is Fall a Good Time to Sell a Home in Santa Barbara? It takes more than luck to buy or sell a home! Licensed Agent. 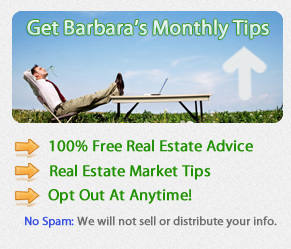 Barbara Reaume is a Santa Barbara real estate expert working for Coldwell Banker Montecito. She started her career as a real estate agent in 1984 and offers over 3 decades of experience in real estate sales.